Because they work by steps, and you can accurately control how many steps you move in each direction, stepper motors are a very practical way of moving things to a desired position. This makes them great for most CNC applications. Smoothie comes with stepper motor drivers designed for bipolar stepper motors, with a maximum current rating of 2 Amps. There is a very wide variety of stepper motors around. Bigger motors are generally more powerful. For a given size, motors will have different torques, max speeds, and different capacities to maintain torque as speed increases. It is important you choose the right motor for your application. The most common mistake is to choose a high inductance motor. There are two main "families" of motors out there : high inductance motors are mostly designed for maintaining position and moving rarely ( like on a telescope mount ), and low inductance motors are designed for moving often, and at high speeds ( like on a CNC mill or 3D printer ). If you use a high inductance stepper motor with a Smoothieboard ( or any "CNC" stepper motor driver ), not only will you get bad speed/torque performance, but when moving the stepper motor ( or axis ) by hand, very high voltage will be generated, which can destroy your stepper motor driver. You can recognize a "high inductance" stepper motor by the fact that it's rated inductance is high, in general higher than 10mH is bad. If your motor doesn't tell you it's inductance, rated voltage is also an indication : high inductance stepper motors usually have high rated voltages, a typical value being 12V, where "CNC" steppers have voltage bellow 5V. Bipolar stepper motors have two poles (bi-polar). Each pole is connected to two wires. That's 4 wires coming out of your stepper motor. These have to be connected to your Smoothieboard. Now to connect the wires to the Smoothieboard. Let's call one coil A, and the other coil B. It doesn't matter which is which. Polarity also doesn't matter, all it changes is the direction the motor turns, and you can change that in the configuration file. Now simply connect your two wires to the Smoothieboard's 4 pins for that stepper motor driver as such : AABB or BBAA. Other combinations like ABBA or ABAB will not work. 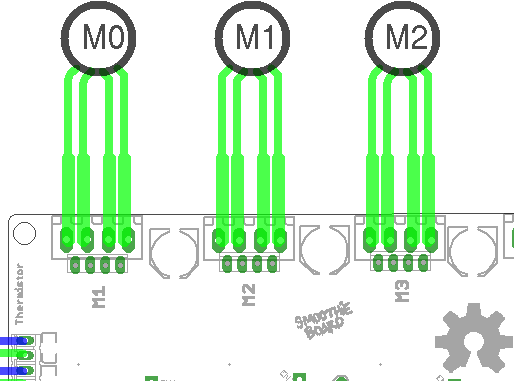 Once your stepper motor is properly connected to your Smoothieboard, it is ready to be controlled. Wiring a stepper motor to a stepper motor driver. In this example, a stepper motor is connected to the M1 driver, and power is provided to VBB ( the main power input ). If you want to use larger stepper motors than the Smoothieboard's drivers can handle ( 2A max ), you need to use external stepper drivers. You can find detailed information on how to wire an external stepper motor driver to a Smoothieboard in the External driver appendix. Example configurations are available in github https://github.com/Smoothieware/Smoothieware/tree/edge/ConfigSamples. You can also refer to the Configuration documentation. The first thing you have to do is tell the stepper motor drivers what is the current rating for your stepper motors is. 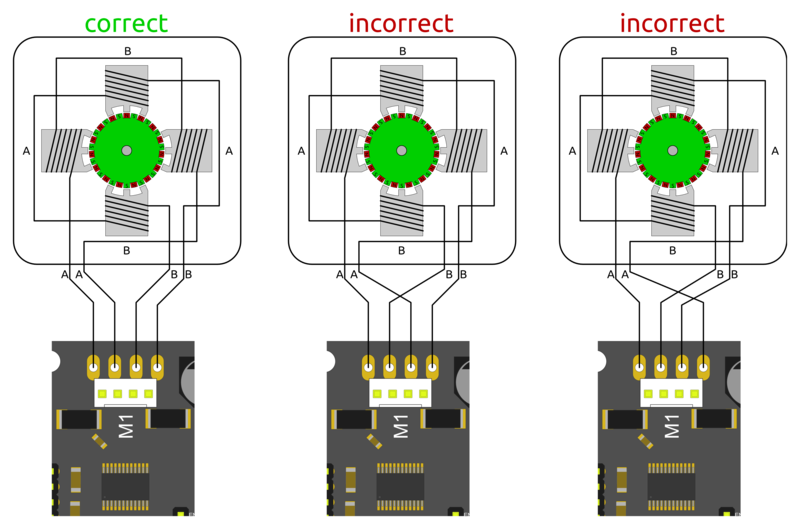 To drive the stepper motor correctly, the driver has to know the motor's current rating. Each stepper motor model has a precise current rating. You can drive your stepper motor at a lower current, which will make it more silent, but also less powerful. But you can not drive the motor at a higher current than it is rated at. This would cause overheating, and possibly skipped steps. The rating is often written on your stepper motor's label ( see picture on the right ). If it is not, you can get it by googling the stepper motor model number, or by contacting your seller or manufacturer. Once you have the correct rating, you can set the corresponding parametr in the configuration file. Now, as described in the "Unboxing" paragraph, connect the board to your computer, open the "config" file with a text editor, and change the configuration value for each stepper motor driver to the correct value. A stepper motor driver operates in steps. It moves a certain number of steps in one direction, then a certain number of steps in another. You think in millimetres. You want your machine to go to a certain position in millimetres, then another position in millimetres. You need Smoothieboard to convert the millimetres you ask of it, into steps the stepper motor driver understands. That conversion depends on your exact arm solution. The most common, and the simplest, is the Cartesian arm solution, and it is the one we will focus on here. Documentation for other arm solutions can be found separately. In the case of a Cartesian arm solution, you simply convert a certain number of millimeters to a certain numbers of steps. That is the steps_per_millimeter configuration option that you have to set for each stepper motor. To compute it, you must multiply a certain number of factors. Each step is divided by the stepper motor driver in a certain number of microsteps. It is that number, and not the number of full steps, that we want. Smoothie always divides steps into 16 microsteps. Do this for each stepper motor driver. In the case of your extruder stepper motor, the principle is the same, but the value is extruder_steps_per_mm. It is now time to test your stepper motors. For this you will need to use host software like Pronterface or the web interface. Now connect to your Smoothieboard over the serial interface. Power your machine on by plugging the PSU into the wall. 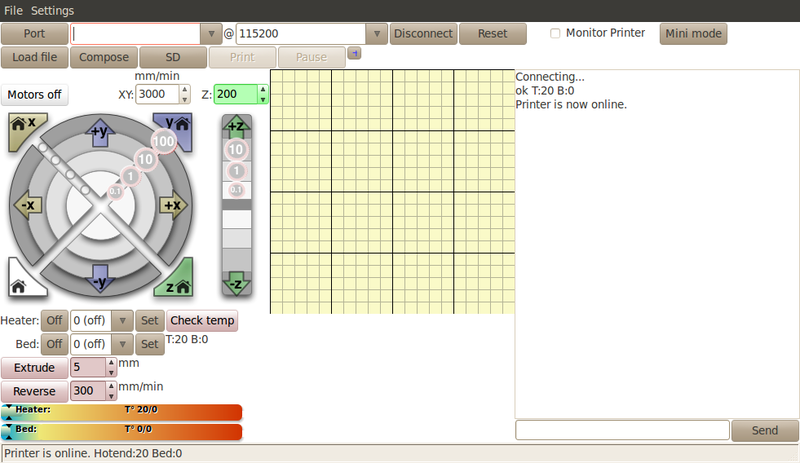 Now you need to move an axis to make sure the stepper motor is turning in the right direction. In Pronterface, click near the yellow arrow marked "+X". Your X axis will move. If it moved to the right, great! Everything is fine, and you have nothing to change. If it moved to the left, you need to invert the direction of that axis. This is for your axes. In the case of your extruder, the config value is extruder_dir_pin. Save the config file, reset the Smoothieboard, connect again using Pronterface. Now the axis will move in the right direction. Do this for each axis. If you have a moving bed in the Y axis for example, as opposed to a moving tool, be careful : what matters is the direction of the head relative to the bed, not the direction of the bed relative to the machine. It's very common to get confused and invert your Y axis on moving bed machines (or not invert it when it should be). Basically, if an asymmetrical object looks like the model when it is printed, then your Y axis is correct, otherwise you need to change your configuration.